The gift shop at the Walt Disney Family Museum is one of my favorites anywhere. The eclectic mix of things to buy extends beyond just Disney merchandise (although there is plenty of it) but instead strikes at the root of Walt’s imagination and love. In most Disney souvenir stores there is a wide array of items labeled with the name of the location itself. And while there is a fair amount of shirts, postcards, pens, pencils, and pins with the WDFM name on it, what makes this place so remarkable is the things you’ll find that don’t bear their logo at all. Old Disney movies that are hard to find elsewhere pepper the store in different locations. A nice selection of Disney Golden Books – both classics and new ones – are prominently on display. And original books that were the foundation for many Disney movies can be bought written by their original authors. It’s the little things that make this such a fun place for the die-hard Disney fan to peruse. Books about art and animation, books about some of the great Disney legends, a film about Frank Thomas and Ollie Johnston (titled Frank and Ollie) caught my eye. It is just so neat to find out what you can uncover in this store. There was a great selection of Pinocchio merchandise this last time through because of the special exhibit. Pinocchio puppets were available, but not a Disney version of one, but those similar to the vision of the original puppet. Whatever exhibits are being featured, you’ll find some great items to pique your interest. There was an Alice in Wonderland chess set on display, but not a Disney-fied version. Instead it looked like the figures might have hopped out of Lewis Carroll’s book directly. Not to say there isn’t some great Disney souvenirs. 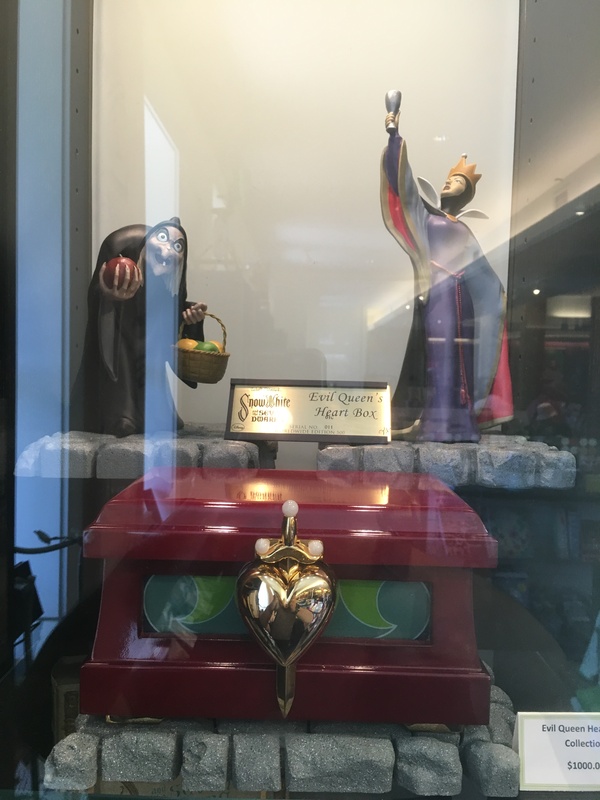 The Evil Queen’s heart box was on display in one of the cases around the store. A beautiful limited edition item (this one was number 011 of 500), it was set on display with its own unique decorations as if it came from the movie and appeared in real life. Of course, you’ll also find some wonderful treasures pertaining to Walt Disney and his life. You’ll often see a wide selection of train related merchandise (one of Walt’s great passions) located in the gift shop. And other items that look like they might have at one time been in his office. The entire store looks less like a traditional gift shop than a home with shelves and bookcases and other items on display as if you were touring through Walt’s personal collection. They do have a nice selection of traditional souvenirs. My daughter had to add a pen to her collection whose tip looked like the tip of a paintbrush as well as a pencil with an actual paintbrush on the other side. For me, I had to get one of the shirts this time which were nice and light to wear. Last time we ended up buying mood pencils (that change color with the heat of your hand) and a couple of collectible pins. They do retire their pins so if you see one you like get it while you’re there. Overall, any Disney fan will have a good time looking through all the treasures of the Walt Disney Family Museum gift shop – a true treasure trove of memorabilia. Curious about the museum itself? Peruse two of the displays at WDFM – Disneylandia and Mickey Mouse Park! Wasn’t this just the nicest place? It was so lovely! I cried the whole way round! I’m looking for the N scale 2010 Disney Christmas Car and the 2015 Disney Christmas Car, both by Lowell Smith. Please notify me if either or both are available. Thank you. Sorry Peter but I don’t work at the gift store, I just think it’s really cool. However, I looked up the phone number and you can call them at (415) 345-6800. They are closed today so you won’t get an answer, but you can also contact them through their website I believe or by email. They do carry the Christmas cars if I’m not mistaken, but just not sure if they have those particular ones. Good luck!